For banks, real estate agents and homeowners, knowing the value of a home is an important element of various transactions. But traditional home valuation methods are overly general. They use historical sales data to track prices of neighborhoods over time in order to get an average house estimation for individual homes within those neighborhoods. Deep learning could help build more accurate, data-driven support tools to better assist real estate agents, homeowners and analysts in getting sophisticated housing valuations using existing additional data types, such as images. Click here for the full version of the tutorial. In our tutorial “Predict California house prices,” you are guided through the task of constructing a deep learning model in order to predict a specific house valuation, given the neighborhood’s demographic location. For this exercise, we use the Calihouse dataset, comprised of two combined datasets: California housing and OpenStreetMap. The California housing dataset consists of data collected from the California 1990 Census and includes 20,640 examples of block groups, each containing an average of 1,425.5 individuals living in a particular geographical area. There are 10 different variables per example. Additionally, we’ve added an image map of the location to the demographic information, with the purpose of improving the accuracy of the deep learning model. Want to get started with creating your own house valuation model? 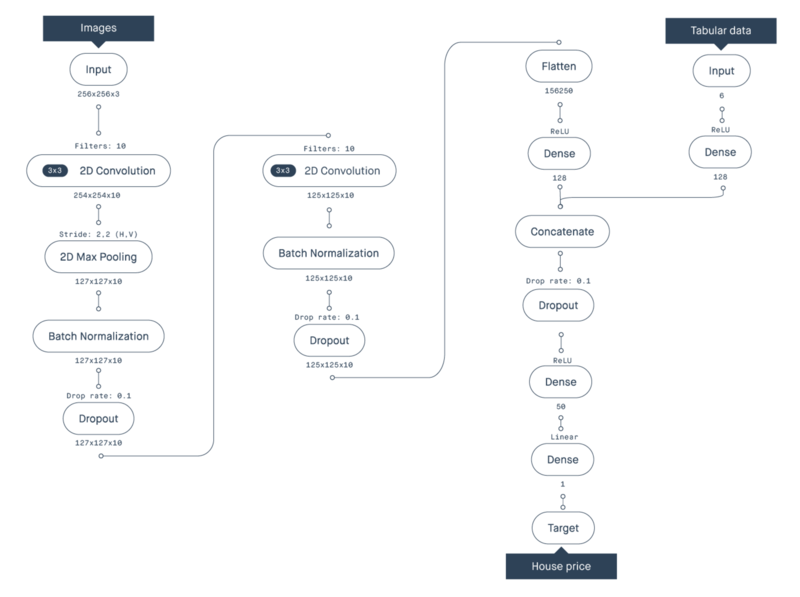 Visit the Knowledge center, for the complete tutorial, with step by step instructions on how to build an AI model for house valuation using the Peltarion Platform.